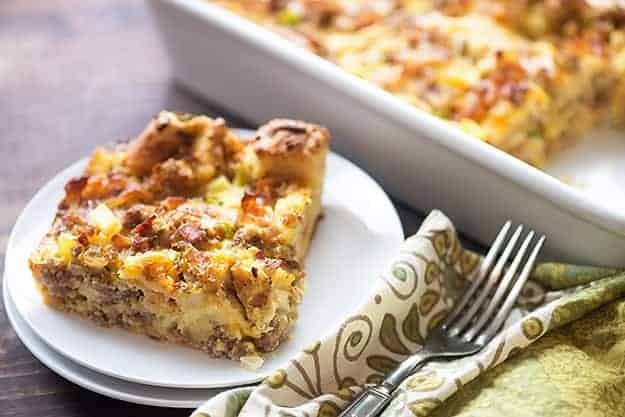 Breakfast Casserole Recipe with bacon and sausage! 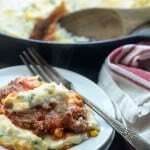 If you’re anything like me, you’re going to love this cowboy breakfast casserole with bacon! 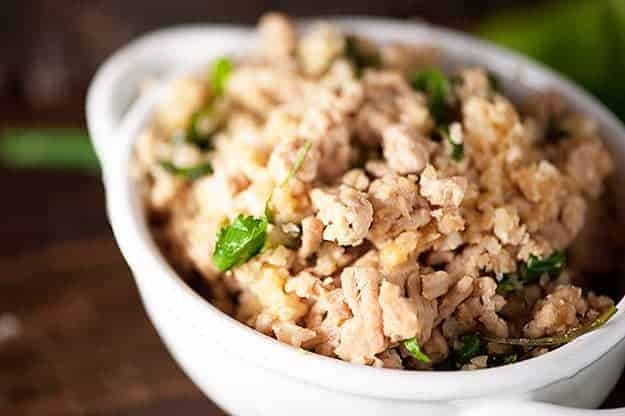 It’s full of meat, packed with veggies, and is easy to make ahead for busy mornings! 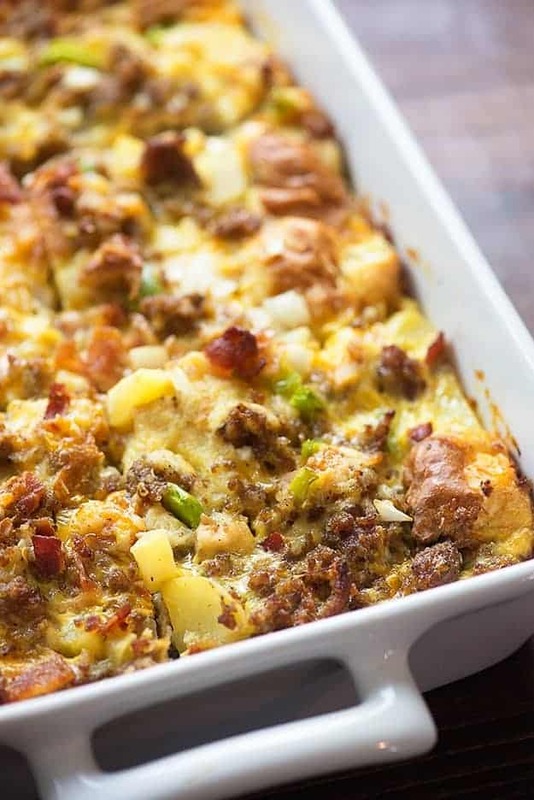 This easy breakfast casserole will feed a crowd! We moved into our home a couple of years ago and we’ve been so happy here. We knew when we were house shopping that we wanted something that was good for entertaining. And, yeah, we totally felt like a couple on House Hunters every time we said that. I also might have made the joke about the master closet being all mine. Because I’m nothing if not a cliche. Anyway, I know people love to make fun of the House Hunters couples for all this entertaining they imagine themselves doing and I get it. I mean, I used to dread having people over. Like, all the cleaning you have to do in advance. All the planning. All the cooking. All the thinking about it and stressing about it. 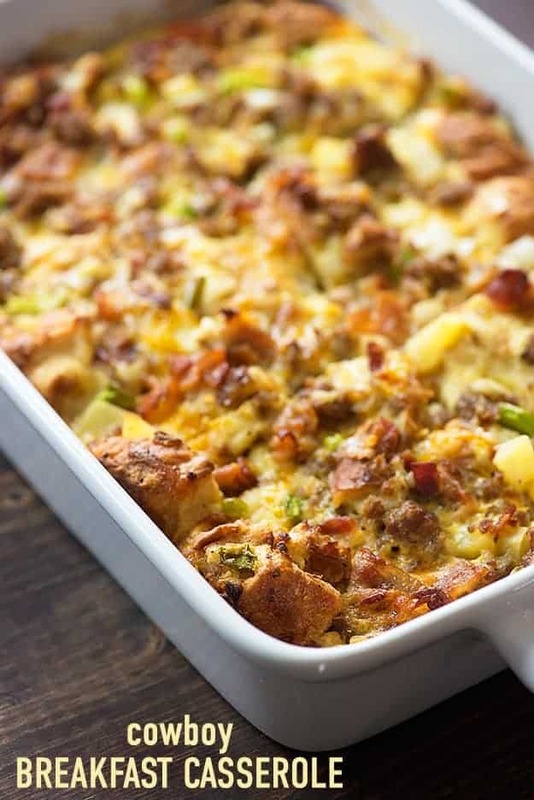 My breakfast casserole recipe is perfect for feeding a crowd! And now, it’s like a flip switched or something, because inviting people over is basically my favorite. We love to entertain! <— Entertain sounds so much fancier than what we actually do, which is generally just set all of our booze out on the kitchen counter and tell our friends to have at it. We even took over Christmas day for my family. We used to go to my mama’s and now everyone comes here instead and nothing makes you feel more like a grown up than hosting Christmas. I like to do brunch rather than lunch, because it feels fancy and it’s just not something that we really ever do. It’s fun and different and I love it! The first year I hosted was literally the most stressful thing I’ve ever done. Trying to cook brunch for a bunch of people can be tricky, my friends. Enter this casserole. It’s definitely happening for Christmas this year. It’s perfect for preparing the night before, which means that you just wake up and pop it in the oven. Serve it alongside a green salad and some mimosas and you’re good. 🙂 Maybe throw in some oven roasted potatoes for good measure. 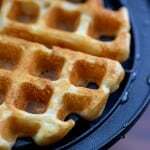 The best waffle recipe ever is always good for brunch. Or be like me and go way overboard, serve 10 different dishes, and completely stress yourself out. Ahhh, the magic of Christmas. 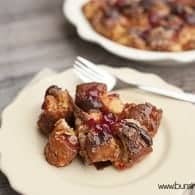 Breakfast casserole recipes are perfect for Christmas morning! Anyway, I’m calling this a cowboy casserole because it just seems like a thing that tough, manly cowboys would eat. It’s packed with bacon, sausage, and eggs. It’s super filling and tastes amazing! I hope you guys give it a try and like it as much as we do! 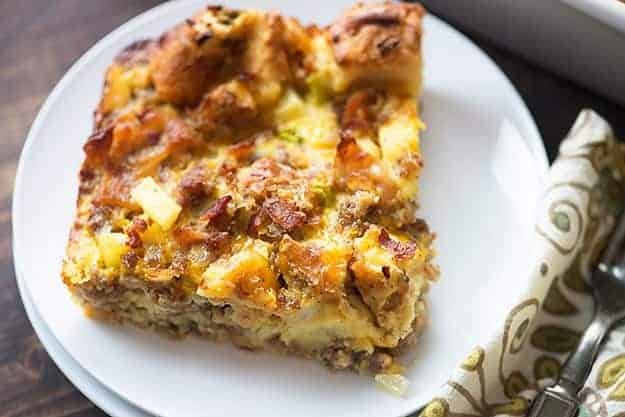 I love having a few breakfast casserole recipes on hand for busy mornings! 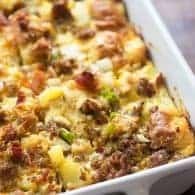 This easy breakfast casserole is loaded with sausage, bacon, cheese, and veggies making it the best breakfast casserole ever! You're going to love it. Add the eggs and milk to a large mixing bowl and whisk until well combined. Pour mixture into a greased 9x13 baking dish and cover tightly with foil. 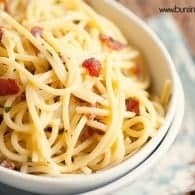 Place in the refrigerator overnight or for at least 4 hours. Bake uncovered in a 350 degree oven for 45 minutes or until the top is golden brown and the eggs are set. Let stand 10 minutes before cutting and serving. 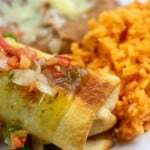 This type of dish is totally how I do stress-free “entertaining” too! I could eat this for breakfast, lunch or dinner! okay………..I give up………..where is the recipe?? Oh good…I thought It was just me who could not figure out how to open up the page for the “rest of the story”. hmmmm……..the video shows a potato but the recipe does not – which is it?? First of all, I think I might make a drinking game out of House Hunters–you drink every time the wife says she won’t share the closet, or someone hates carpet, or a load-bearing wall needs to come down to make the house open concept. I watch too much HGTV. Second, this casserole has me so excited for Christmas! It sounds perfect for my family :). 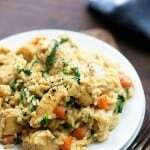 This recipe will be used for the men’s breakfast at our church. 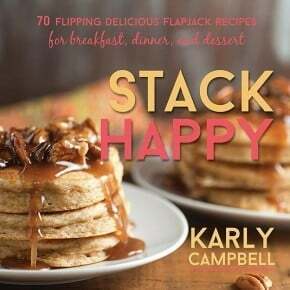 We are always looking for new breakfast recipes. This one sounds like a very tasty one. This is the kind of recipe I love having in my back pocket! Perfect for the holidays when all the kids are home! Pinned! For many, many years I hated entertaining on holidays and birthdays because it almost always meant that my in-laws (a group of 4) moving in on us for the entire weekend. It was so much work, before, during, and after. Now that the weekend stays are rare, I am able to fully enjoy entertaining. I’d love to find a perfect entertaining home like those house hunters. 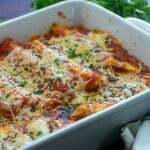 This casserole is perfect for get togethers! There is so much yumminess in it. And I love that you can prep it ahead of time. 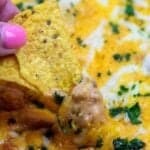 I love make-ahead casseroles! This one looks and sounds delicious, plus the name is perfect! The sausage should be cooked, but not the potato. I love a breakfast casserole! There are only two of us so, entertaining is about the only time I make them. Will keep this in mind for the next time we have overnight guests. Stay be a silly question but would you say like a half loaf of French bread?? I think it’s closer to a full loaf. 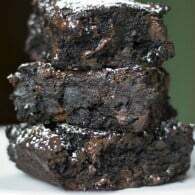 Anyone make this without letting it sit for 4 hours refrigerated? What’s the worst that could happen??? How can you say ‘Total Time’ is 55 minutes when later in the recipe you say refrigerate 4 hours????? My wife started this recipe and learned halfway thru the process we had to create an entirely new dish. Sorry about that John! I’ve updated the recipe card to reflect the chill time. Do you put this in the oven straight out of the fridge, or let it come to room temp first? Thanks! I put it in right from the fridge. Could you use the frozen hash browns instead and just defrost them first? I haven’t tried this, but I imagine it would work fine. This was delicious. I only had four slices of French bread, I shredded my potato, and I skipped the bacon as a personal preference. My family liked it a lot. I let it bake for closer to 55 minutes. It was still a bit runny in the middle at 45. Maybe because of the lesser amount of bread? Or maybe because of the shredded potato. Shreds tend to weep more in my experience. In any case, it was perfect for our breakfast this morning. Thanks for a great recipe! I’m definitely keeping it in my food planner. I had company this weekend and made this exactly as instructed. I cooked it for 45 minutes and the potatoes weren’t cooked. I put it in the oven for an additional 20 minutes and they still weren’t completely cooked. I was very disappointed. I’m sorry this didn’t turn out for you. I wonder if your potatoes were cut larger than mine? I’ve never had an issue with it. Hi I’m making this Christmas brunch, do I sauté the veggies? I do not, but be sure to dice them up fairly small so they get a chance to cook through. Can I use cooked potato hash browns meats and veggies and mix it in or do you think it would over cook those ingredients? I haven’t tried this, but I do think they might be a bit overcooked. 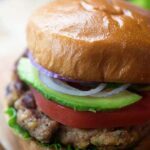 As a cattle rancher, I give this recipe high marks. I would probably par boil or pre-cook the potato. If everything goes in cooked, except the eggs maybe I could cut down on the cooking time a little. I’m trying this this evening I didn’t let it set in the fridge and used frozen o’brien potatoes hoping it turns out ok?